Support Group: These two little words can create a mixed bag of feelings. No one wants to need a support group. This need makes us feel insufficient, dependent, vulnerable, raw, and exposed. Those words can also be used to instill hope. Since you’re reading this, it is likely that the challenge of caring for someone with a mental illness has become greater than the fear of going to a support group. Going to a support group for the first time can cause a lot of anxiety: I’m not going to know anyone there. What if they ask me to talk? Will they expect me to follow some kind of steps or get a sponsor? Let’s see if we can answer some of your questions and help make your first NAMI meeting a little easier. How much does it cost to attend a NAMI support group meeting? NAMI support group meetings are free of any charge. We don’t pass a basket or take up contributions. Are all NAMI support groups alike? Every NAMI support group has its own “personality,” so they are all a little different. There’s also a lot they have in common. There are three different types of NAMI Support Group meetings. With Hope in Mind© (WHM) Groups are for family members and friends of persons with or suspected of having mental illness. They are facilitated by specially-trained family members who understand because they are care providers, too. BRIDGES© (Building Recovery of Individual Dreams and Goals through Education and Support) Groups provide support for persons with mental illness. They are facilitated by people with mental illness, who are living in recovery. Combined Groups When it is a small group, family members and persons with mental illness combine to form a mixed group that is inclusive of anyone who attends. Whenever and wherever it is possible, both family groups and groups for persons with mental illness meet at the same location at the same time but in different rooms. This type of peer-to-peer support is a NAMI fundamental. People who attend the With Hope in Mind meetings are often parents, spouses, siblings, significant others or adult children of persons with illnesses like Depression, Bipolar Disorder, Schizophrenia, Anxiety Disorders, Post Traumatic Stress Disorder, and other serious persistent mental illnesses. People who attend BRIDGES meetings are persons who live with these same illnesses. Do I have to let someone know I’m coming? No. Pre-notice is not required to come to a meeting. You can call and speak with one of our Regional Coordinators before attending a meeting. The Regional Coordinator can put you in touch with someone who will be at the meeting or possibly meet you there. That way you will at least know a person’s voice or who to look for and a little about them before you get to the meeting. Where are NAMI support group meetings held? 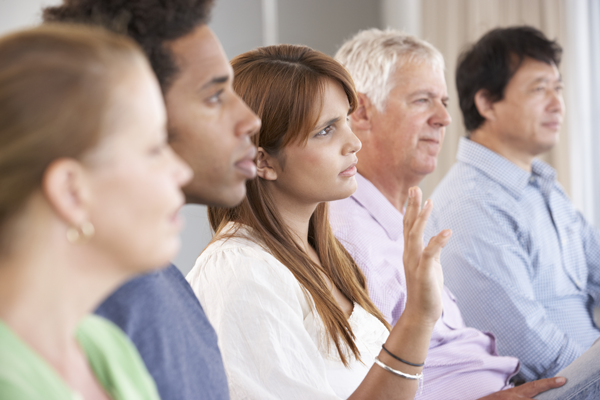 Most support group meetings are held in churches, community centers, healthcare provider offices, or other public venues well known within the community. How will I know how to find the meeting? There will be signs at the location to let you know where in the building the meeting is held. Someone will greet you and tell you a little about how the meeting is set up. They will ask you to put on a name tag just like they are wearing, so no one has to feel awkward about remembering or using wrong names. They will ask you to sign-in on a participant form. The form asks for some basic information, but you are not required to provide any information you don’t want to. The information you provide in support group stays with your local group. Your information will never be given or sold to any other party (including NAMI’s national and state organizations). Our support groups are not led by mental health professionals, nor are they group therapy. They are “peer-to-peer self-help” groups led by specially trained volunteers who also care for someone with a mental illness. They understand because they’ve been there too. They are there to listen, share resources, or to offer advice—but only if you request it. They are willing to share what they’ve learned, what worked for them, and what didn’t. What happens when the meeting begins? The meeting facilitators will introduce themselves to the group. Someone will read the group’s Focus Statement followed by the Meeting Guidelines and Affirmations. Everyone in the room will be offered an opportunity to briefly introduce themselves to the group or decline. After introductions, the facilitators will open the floor for discussion or offer a topic for discussion. Do I have to talk/tell my story? No. Meeting Guideline #9 is: “Everyone is given the opportunity to speak, as well as the right to decline to speak.” You do not have to talk unless you want to. Why aren’t NAMI support groups held more often? All NAMI support groups are managed and facilitated by volunteers. They are held as frequently as there are facilitators available to lead them. For urban areas that is more frequent, up to six times a month, while our rural affiliates may only have one meeting a month.